This book is about guilt. It is about the burden of guilt. The important thing to recognise about guilt is that you have to live with it, for ever. And, of course, the guilt can spread, like a stain on a clean white tablecloth. That is what happens to the Colbert family in this story. John-Paul Colbert is just sixteen years old when he is implicated in a disaster in a local theatre. He is at work there one evening when the balcony collapses and crushes 22 children who are attending a hallowe'en party. Unfortunately, minutes before the collapse, John-Paul had lit a book of matches in order to inspect the balcony. It was a misjudgement. A mistake. But although he was subsequently cleared of any fault in the disaster, his name is permanently linked in the minds of the bereaved and the survivors. He receives hate mail, telephone calls at all times of the day and night, and other vague or specific threats. You might wonder why John-Paul does not just move entirely away from the area and try to start a new life somewhere else - I think he probably feels that he owes it to the stricken relatives and survivors to be available for punishment, down through the years. That is how he bears his guilt. But as John -Paul grows up and marries and has a son of his own, the guilt is borne jointly by all his family. 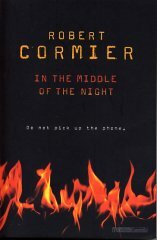 The ringing telephone blistered the night, stripping him of sleep, like a bandage torn from flesh. He looked towards the digital clock: 3.18 in vivid scarlet numbers. Instantly alert, he thought: it's beginning again, but too early - much too early this year. The first call usually came some time in October, a week or two before the anniversary. This, however, was early September. In the final hours of a lingering heat wave. Fans turned lazily in the bedroom windows, fans that did not blur the sound of the telephone, incessant and insistent. Please make it a wrong number, he prayed. Raising himself on one elbow, he listened, counting the rings, pausing after each one ... six (pause), seven (pause) ... and heard his father padding wearily down the hallway. Did not actually hear his father, but felt him proceeding slowly, reluctantly, but going all the same. Denny Colbert never answers the telephone. It's a rule of the house. But this year, Denny is sixteen years old - the same age that his father was when the disaster happened. And somehow Denny wants this year to be different. It's a rite of passage, to emerge from underneath the shadow of his father's misfortune, which has darkened all his childhood. Who is on the other end of the telephone? And will it help if Denny speaks to the caller? This is a brilliant book, full of nervous suspense. The story is grim, and unpredictable. Read it. I don't think you will be able to put it down, once you start.